The snake plant or Sansevieria pronounced (san-se-vi-ee’-ri-ah) a member of the Lily Family, popularly goes by other common names. The very “politically correct” Mother-in-Law’s tongue and Bowstring-hemp. The durability of Sansevieria makes it an excellent choice for apartment dwellers that often have limited success with houseplants due to lighting issues. 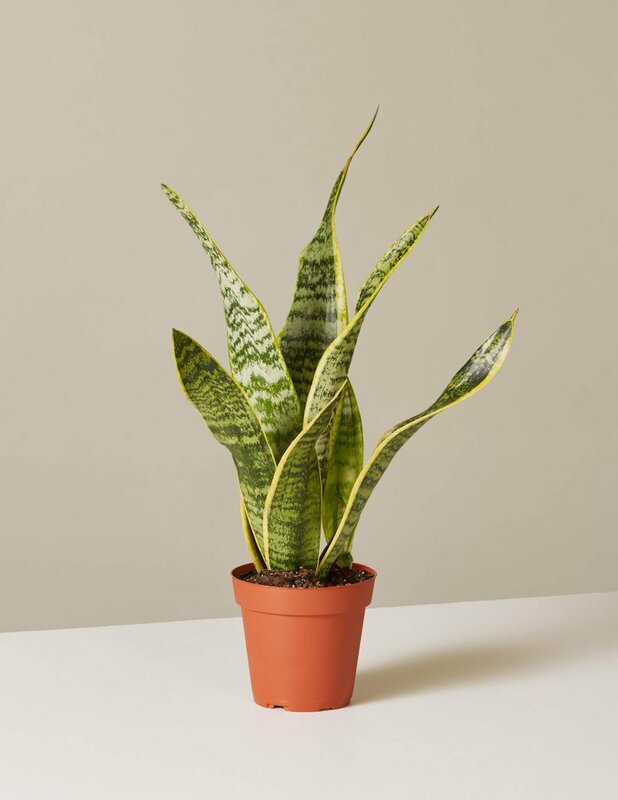 After learning these 6 snake plant benefits proven in research and studies of top organizations, you would like to grow this houseplant immediately! The Sansevieria is an ideal plant for indoor spaces because it is a superb air purifier. Studies, including those performed by NASA, have consistently shown the plant to remove toxins such as formaldehyde, xylene, toluene, and nitrogen oxides—which means that industries and workspaces such as automotive plants and shops, aircraft plants, plywood, carpeting, paint makers and sellers, printing, and offices, where these chemicals abound in the products produced and used, would greatly benefit by keeping several Sansevieria around. NASA, whose study purposed to determine how to clean the air in space stations, recommends at least 15 to 18 medium-to-large size plants for a 1,800 square-foot home. Snake Plant a.k.a. Mother-In-Law’s Tongue (MILTs): Of all the different oxygen producing plants, this one is unique since it converts a lot of CO2 (carbon dioxide) to O2 (oxygen) at night, making it ideal to have several in your bedroom. 6-8 plants are needed per person to survive if there is no air flow (meaning you could live in a completely air sealed room if you had these plants). The snake plant also removes formaldehyde from the air. Snake plant absorbs toxins and releases oxygen. The plant may releases moisture in the air and lessens airborne allergens. The Sansevieria meets these conditions perfectly. Persons with allergies, therefore, should find a friend in such plants because they are a natural and cheap way to stay healthy. Further, public spaces and workplaces, especially, should be aware of the value of air-purifying plants for these reasons. Sick building syndrome (SBS) describes the way the health of certain individuals of a certain residence or building acquires moderate to acute symptoms that are linked to the building while no specific illness can be identified. Most of the symptoms involved with SBS appear to be related to poor indoor air quality. They include ear, nose, and throat irritation; coughing; itching; dizziness and nausea; lack of concentration; fatigue; even chest tightness and muscle aches. But the symptoms leave not long after individuals have departed the building. Now there are a few things that plausibly explain this, like ventilation that doesn’t properly distribute air; chemicals from carpets, upholstery, copy machines, pesticides, and cleaning agents; outside pollutions being pumped in; bacteria, molds, and viruses. Do you see the alarming link between these explanations and formaldehyde, xylene, toluene, and nitrogen oxides? The Sansevieria is a ready remedy for SBS. Sometimes the Mother-in-Law’s Tongue plant, also called the Snake Plant (Sansevieria trifasciata) is considered a bad Feng Shui plant. However, this is not true, because the Snake Plant can bring very helpful feng shui energy when needed in specific areas of a home or office; this plant has strong protective energies. Spiky plants like snake plants are excellent for shielding you against negative Chi, but their aggressive energy means you need to place them where they’re not in highly-trafficked areas of your home. The snake plant is a perfect expression of upward, growing ch’i. The strong wood energy cuts through negative or stagnant energy. The best position to place the plants in your office or home is a place that is enriched by the plant’s Wood element. Southeastern, Southern, and Eastern corners are the best feng shui spots to place your plants. With all the other Snake Plant Benefits and facts listed above, one more to add is it’s one of the best low maintenance houseplants in the world. It can thrive in full sun, in full shade, in lack of water. Basically, it thrives on neglect. Apart from being one of the best air purifying houseplants, it looks so nice and unique. The unsloped, thick and tall foliage without stems look so artificial, and on top of it, the shades of green, yellow or gray with the horizontal stripes make it a desiring indoor plant.